It is a great pleasure to share with you this excellent news: last week Karisma has started selling rooms for Azul Fives. It is possible therefore to make reservations for dates after October 1st. Either European Plan or the unique Gourmet Incluisive ® concept, Azul Fives is offering 1, 2 and 3 bedroom Suites and Penthouses, designed for large families or friends, with hotel services available including: Spa, restaurants, 2500 m2 swimming pool, beach club, sports courts, concierge, personal butler, valet parking, all with the personalized attention that distinguishes Karisma. 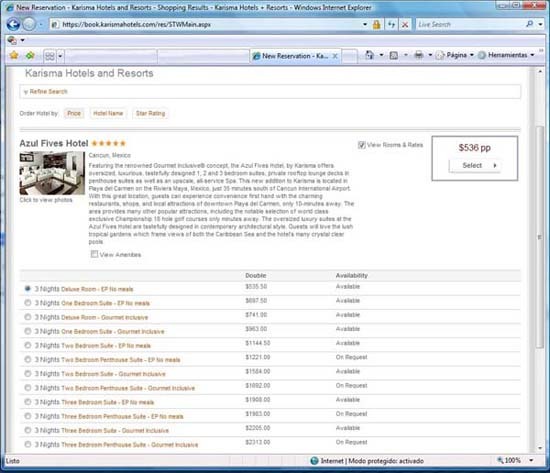 At Karisma website main page, click “Check Availability and Rates” at the bottom of the page, then you can select the hotel, dates and number of guests. Another window will be displayed to select the package and room type. Entry filed under: Azul Fives Hotel, The Fives.